French cuisine is famous for its elaborate and elegant dishes – but not all of them are as complicated as you think! A popular quiche is a unique treat – it can be eaten cold and hot, for breakfast, lunch or dinner, and its fillings are only limited by your imagination. 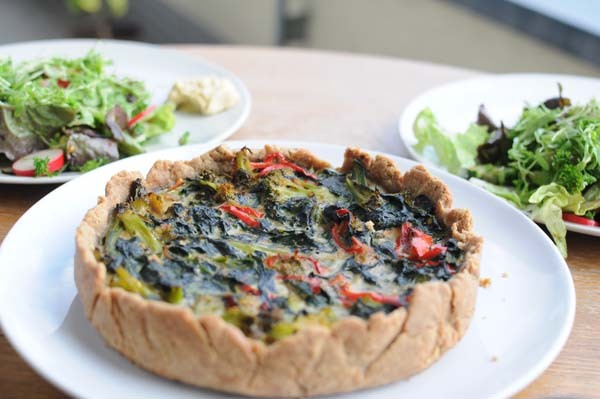 We would like to share with you our simplified, healthy option of quiche recipe – we hope you’ll love it as much as we do. Let us know in the comments what your favourite quiche filling is! Step 1. Mix flour with ghee – it should obtain a crunchy, uniform texture. Be patient, it will take a few minutes – basically, you need to rub flour and ghee into each other. Step 2. Whisk 2 eggs slightly and mix them with the flour and ghee. “Massage” the dough nicely, until you can roll it into a firm ball. Step 3. Preheat your oven to 200C. Line a tart tin with the greased baking paper, roll your dough and line the tin with the pastry. Put the crust into the oven for 5 minutes, then take it out and put aside. Step 4. Prepare the filling: fry onions. In a separate pan, fry mushrooms and the rest of the vegetables. Note that vegetables should not be overcooked, and should retain a slightly crunchy texture. Add any herbs for garnishing and enjoy this easy quiche with the entire family!